Taking on a 50K trail race is something I have pondered over time, years of time actually since I am now solidly in the 65-69 AG. After canvassing opinions from experienced ultra running friends, I chose May as the month and the Dirty German Endurance Fest as the event. 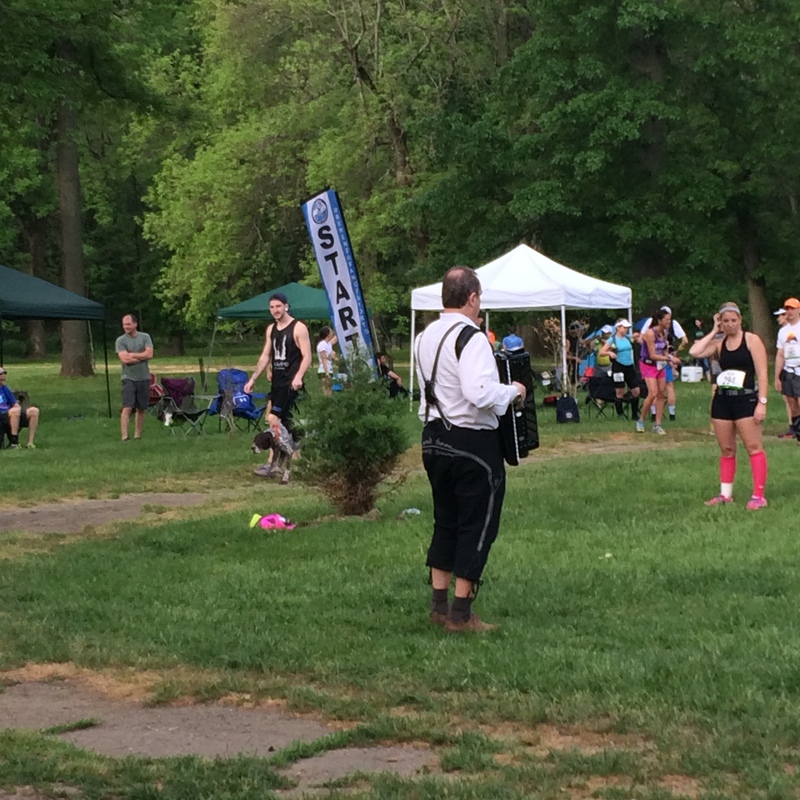 The Dirty German has 25K, 50K and 50-Mile options through Pennypack Park in Philadelphia. It was billed as suitable for beginners yet offering enough challenge for more experienced trail runners. I found the description accurate. A more experienced trail runner could run this entire course. I chose to walk in some areas, staying conservative to ensure I could finish uninjured. To test my trail legs, a couple of friends were kind enough to do a 21-mile run/hike with me on the Appalachian Trail prior to the race. With 2/3 of that 50K trail distance completed and still feeling strong, I was ready for the 50K. Race morning dawned with high humidity and temperatures climbing early. Within the first mile, I could see shirts ahead of me already sweat-soaked. My ponytail provided a personal air conditioning system, sprinkling cool drops of water down my back. The shade from huge trees and the bubbling of the creek offered physical and mental barriers to help ignore the mugginess of the day. The paths were soft underfoot with the expected rocks and tree roots mixed in here and there. The toughest areas to run were 2 miles of paved bike path as well as a short section of rough dried earth that looked like leftovers of a tractor track, jarring enough that I walked the grass section beside that hard earth. The course includes two creek crossings. I made it across the rocks, barely getting a toe wet. Making way through a flat single track switchback section I could hear the accordion and the start/finish activity. Beginning the second loop, it felt like luxury to run on those soft trail surfaces and listen to the creek bubble. There were enough other runners out there to feel comfortable but also enough personal space to listen and watch nature unimpeded as my feet took me on this beautiful second loop tour. The Dirty German was my first experience with a different type of aid station. For road marathons, I keep my food intake to a few energy beans and maybe a bite of an energy bar in the last few miles. Adding 6 miles on trail required more substantial intake. 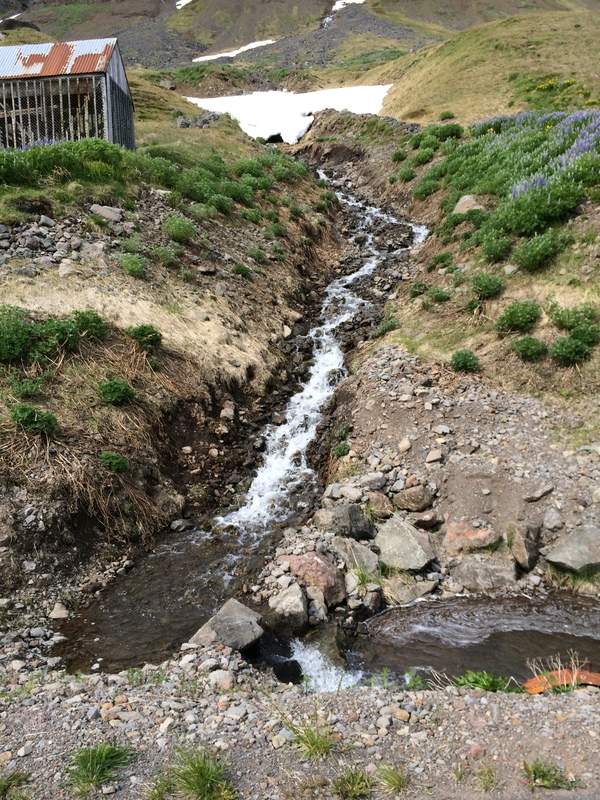 At each aid station, a volunteer quickly filled my hand-carry nearly-empty water bottle. I reached for a chunk of potato, dipped it in salt and chased it with a glass of Coke. Fortunately, my stomach didn’t rebel & I was good to the next aid station. 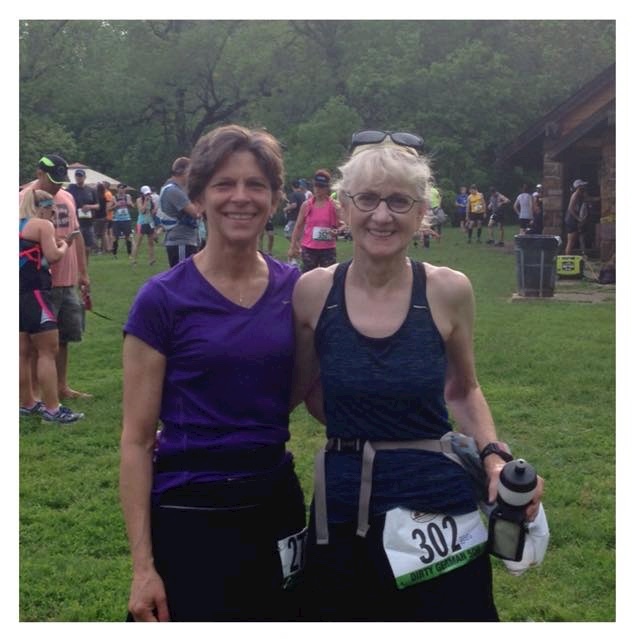 Post race with running friend and 1st 50K Women Masters, Becky. My loose goal was to complete the 50K course in 8 hours. As it turned out, my finish time was 7:05:58. I saw my friends Becky and Jeremy (you can read about Jeremy’s ultra running exploits on his blog The Road to Trails). Becky had finished much earlier, placing 1st in the women’s masters category for the 50K and garnering a wonderful award – a cuckoo clock – for her efforts. I took a short walk to Pennypack Creek where other runners and families with children were wading in the cool water. I washed the top layer of dust and sweat off legs and arms, did a quick change into a dry shirt, and made my way to the barbecue area for a sausage and German potato salad. We took a moment to thank Race Director Stephan Weiss for a great event and were on our way home. Post-race, I was surprised that with the exception of some minor stiffness, my body was none the worse for wear. The softness of the trails and the changes of pace and stride seemed easier than the pounding on asphalt and cement road running hands out. That may account for some of the longevity of trail runners who have been at this for years and continue to run trails far into their senior years. A New York Times article titled Why Older Runners are Ultrarunners reached the conclusion that older runners are no more likely to be injured during trail running that younger runners. Granted, they were not referring to women in their 60’s who decide for the first time to take up ultras (example #1 behind this keyboard). No, most of the runners in the cited study are men who have had decades of experience running distance on trail. 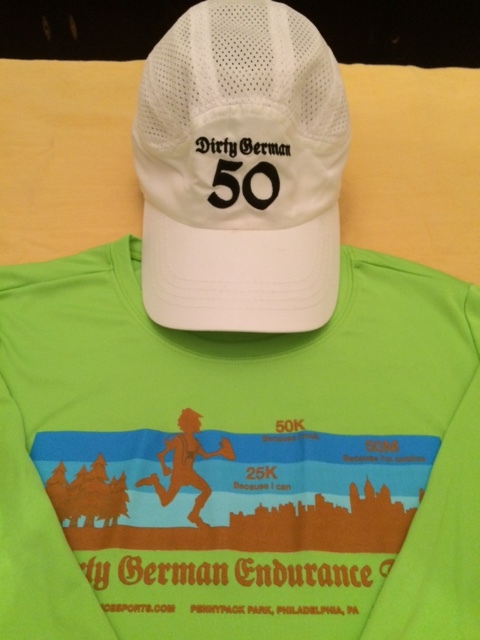 Long sleeve tech shirt and finisher hat. After a first positive experience, I will be incorporating more distance trail runs and trail hiking. I’m not abandoning the roads, but they will be sharing my running time with the trails. One year ago, on my journey aboard the M/V Explorer, we made our way around the shores of Iceland, A cloud-covered sun was already bright in the sky that June morning as I felt the familiar shudder of the ship. On a voyage in and out of ports for 21 days, that sound clued me that we were either slowing significantly or about to enter a harbor. At 4 a.m. – yes, a bright sun at 4 a.m. – I looked out the cabin window and saw the most beautiful site yet on this long and varied trip. 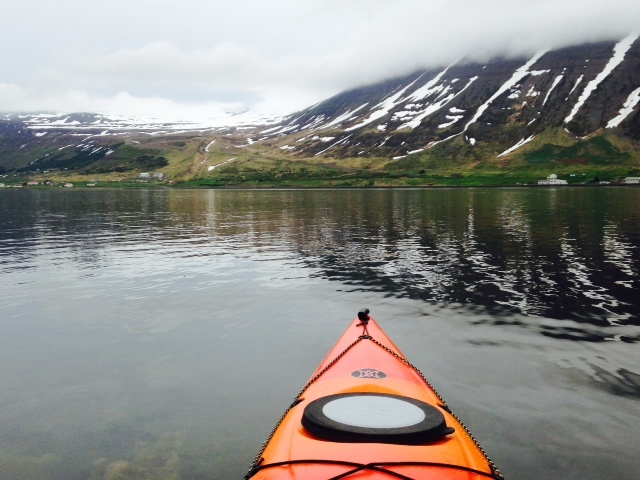 We were entering port at Isafjordur, Iceland. Down the gangplank, I looked for the tour bus marked for kayakers. To my delight, I learned that I would not be taking a bus but instead would walk just a few blocks to another portion of the harbor. And there they were, kayaks in every primary color lined up near the blue morning water. My kayaking experience had been brief, most taking place on summer days and calm lakes in Quebec and the Adirondocks of New York, so a calm fjord sounded just right. The day’s high temperature was 46F degrees (8C). Here, in the hands of West Tours, we kayaked on a beautiful flat surface of clear water. Those around me saw several seals; I saw the scenery directly ahead. Even though I was thoroughly skirted, the kayak was longer than any I had experienced and my center of gravity seemed a bit unstable. 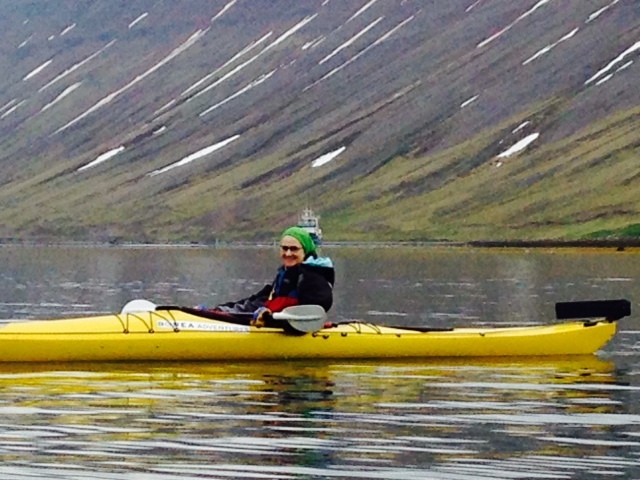 My preference was to enjoy the morning above the water, a beautiful morning with quiet conversation between kayakers. Surrounded by the unspeakable beauty, this was a port to be etched in the mind. Too soon, we were climbing out of the kayaks. Though my upper body had experienced a workout, I was totally energized. Returning to the ship for a snack, I changed into my running shoes before setting out to explore the town and find a trail to run a few miles. The small and efficient information office directed me to a path that would take me on a trail parallel to the highway and – if only time had allowed – to the next town up the road. My first miles were more of a walking pace, assessing my surroundings, breathing in the beauty while considering the safety of my on-foot journey. 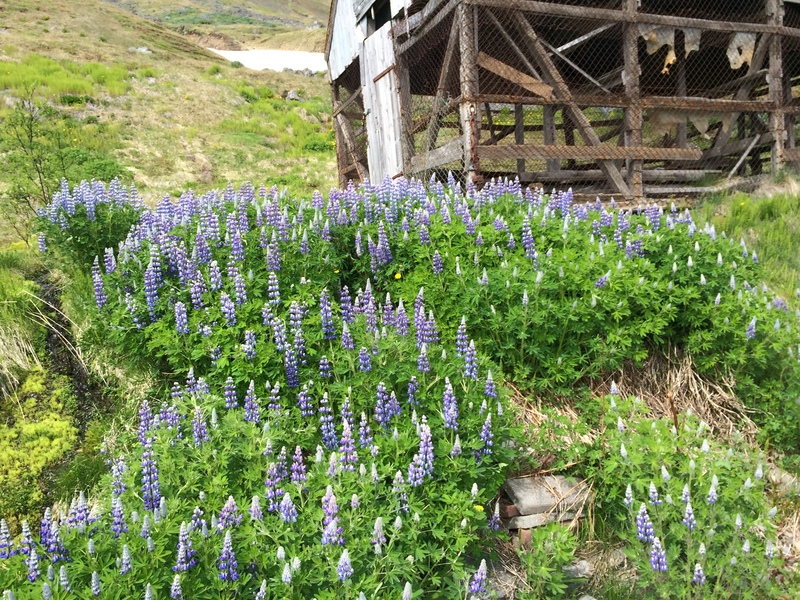 The wired crib, set off by a field of lupine, is used to dry fish heads. 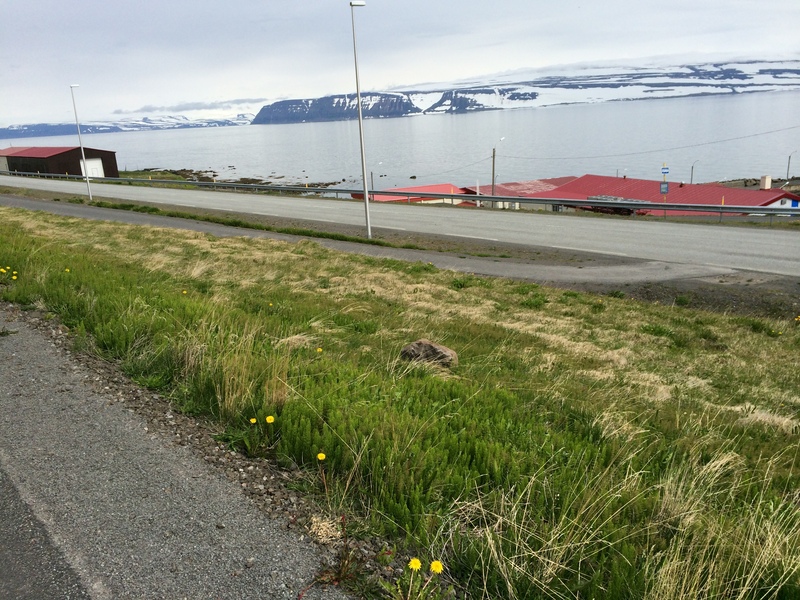 I made my turnaround around mile 3.5, enjoying the return view toward Isafjordur. With the exception of a couple of cyclists and one walker, the path was mine. Melting ice flowing from the fjords under the path and into the bay. Arriving back in town, I stopped in a restaurant for a delicious bowl of fish stew (more about this in a forthcoming food post). Before making my return to the Explorer, I did a quick look through some local shops, accommodating and friendly but not particularly tourist-oriented – a good thing. Typical residence near downtown shops and path. 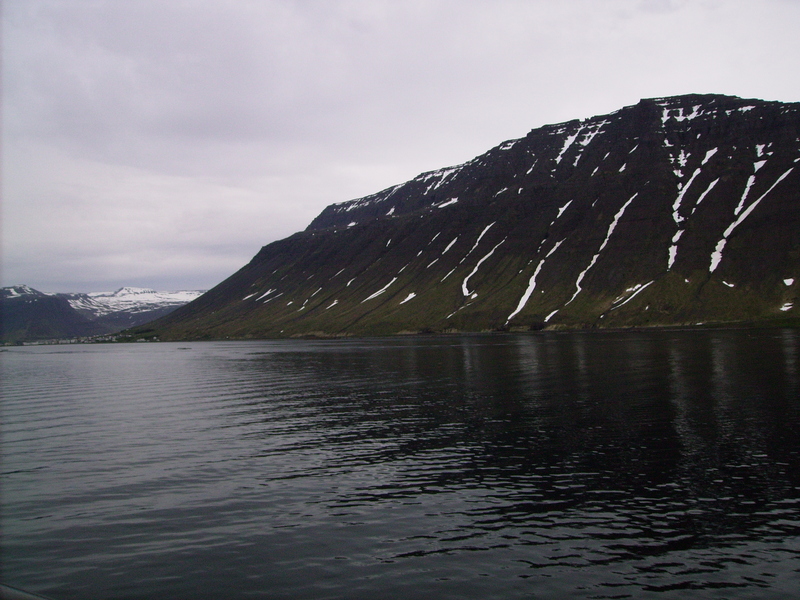 Isafjordur is one of the dwindling authentic locations I have found on this earth and at the top of my list for a return. 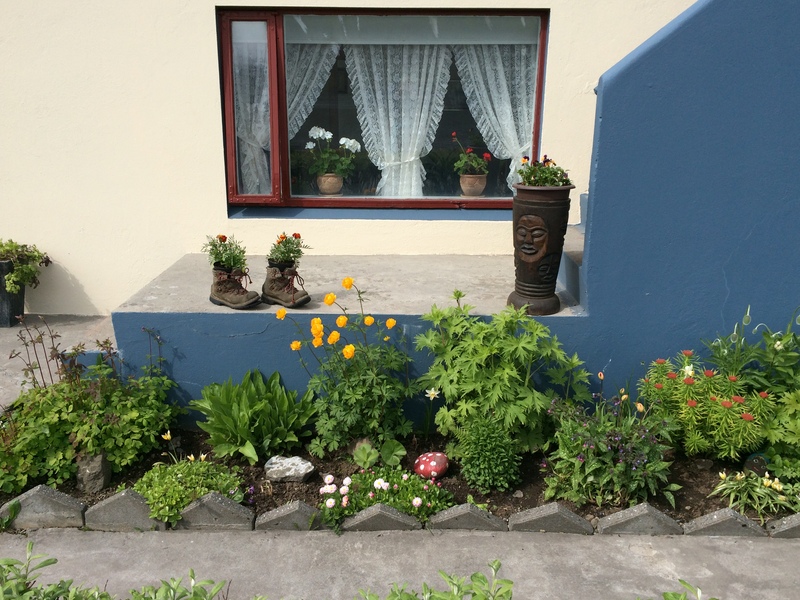 Have you found authentic places and have you returned and found them to have remained authentic?